Although there was a time when I would read occasional police procedurals, somewhat like a palate cleanser between what I might called “more serious” reads, my reading focus has shifted over the past decade or so and, consequently, it’s been a long time since I picked up a crime novel as much for lack of time than anything. 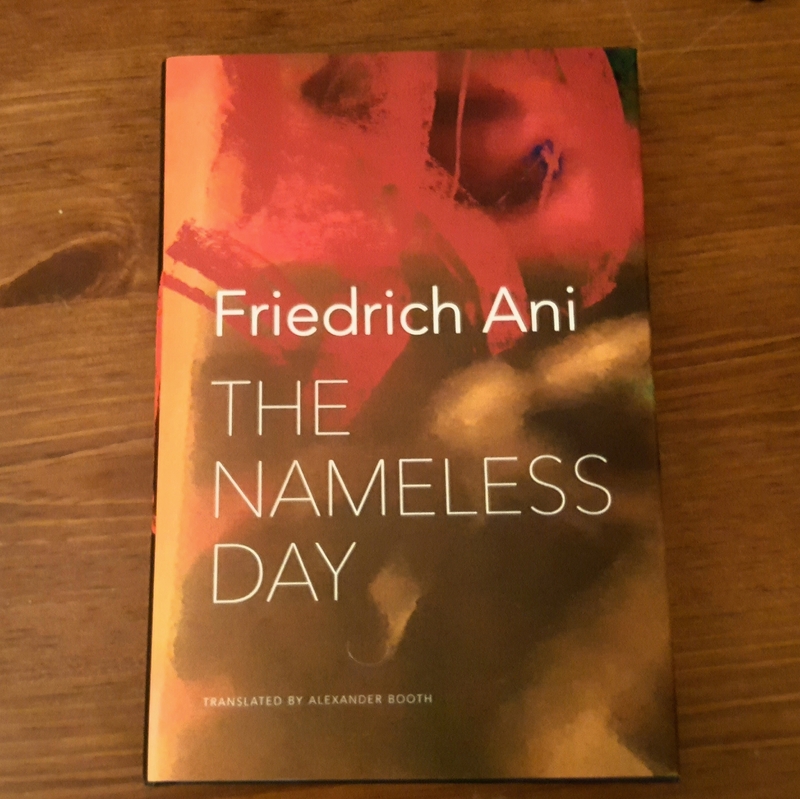 However, when The Nameless Day by German writer Friedrich Ani arrived at my home wrapped in a stunning Sunandini Banerjee-designed dustjacket, I thought that, after so long, it might be a refreshing change of pace. What I found was slower-paced, more character driven, less solution focused read than I might have expected and, in my case, it was a good fit. Recently retired, police detective Jakob Franck is looking forward to settling into an existence that will, he hopes, no longer be haunted by the mournful presence of ghostly visitors from the past challenging him with their unresolved secrets. Instead, he is unexpectedly contacted by a living herald of a case he had not directly investigated but had never forgotten. Twenty years earlier he had been charged to deliver to a family the news that their seventeen year-old daughter had been found hanging from a tree in the park. This particular task, the bearing of unbearably painful news, had become one that Franck seemed to excel at and so he had agreed to make the call. Only the mother was home. As she registered the news, Doris Winther collapsed into the arms of the detective and he ended up holding her, just inside the doorway, for seven long hours. The sort of unprecedented, irregular occurrence that leaves its mark. A little more than a year later, mother would follow daughter, recreating the act in the yard of the family home. Both deaths were declared suicides. Once again Franck caught himself thinking like an interrogator with only the admissible conclusion of an investigation in mind. But the man sitting in front of him, broken and bent by the leaden emptiness of his life, was no witness, he was a relative, a surviving dependent, the father of a daughter, the husband of a woman who had also hung herself and left behind a man who ever since had been wandering through the cages of his questions. The silence, Franck thought, had driven that family into an inner and unsurmountable homelessness. The time to make a wish had never arrived for any of them; not even, he thought, looking towards the door again—no sound came from the other room—for Winther’s sister-in-law in Berlin. Inge Rigah had escaped the approaching shadow in her family’s world rather early, but in the place she had freely chosen to go she had instead become a prisoner of her dream, which she refused to realize or allowed only to remain as a sketch. In Esther she saw herself as a free spirit that no one could cage; and so, after her niece’s death, all that was left was the wrinkled anger she had carried around from the very first time she ever met Ludwig Winther. As Franck works his way through the circle of connected individuals, concerns and accusations routinely circle back to the very man who initiated the reinvestigation of his daughter’s death. If not entirely sympathetic, Ludwig Winther is the tragic victim here. He had wanted to provide a good life for his family and in the end he lost everything—his daughter, his wife, his career, and his home. He became the focal point of anger and blame, accused of being inadequate at the very least, of rumoured unspeakable acts at the worst. Twice bereaved he was never granted the respect and space to grieve. His wife, sister-in-law, his daughter’s classmates all believed that he was directly or indirectly responsible for driving Esther to the point of no return. After twenty years, a small and defeated man, his attempt to find closure by proving to himself, at the very least, that fault belonged to someone else. Whether anyone will find closure at the end of The Nameless Day is debatable. For some crime fiction readers that may be less than fully rewarding. For me, the questions that arise from the facts that we do learn are far more fascinating for the lack of resolution, for fate, and for the things we can never know. The dead may come to visit, but they tend to keep their secrets to themselves. In the end, The Nameless Day is a satisfying, psychologically engaging read. Translated by Alexander Booth, the language is rich and poetic, and Ani’s willingness to leave room for what is unspeakable, unknowable and unsettled makes this a novel that will potentially appeal to a wide audience. The Nameless Day by Friedrich Ani is published by Seagull Books. *Read for German Literature Month 2018.